A starter (also known as a polish or levain) is a fermenting dough or batter, all or part of which is used to raise a batch of bread. 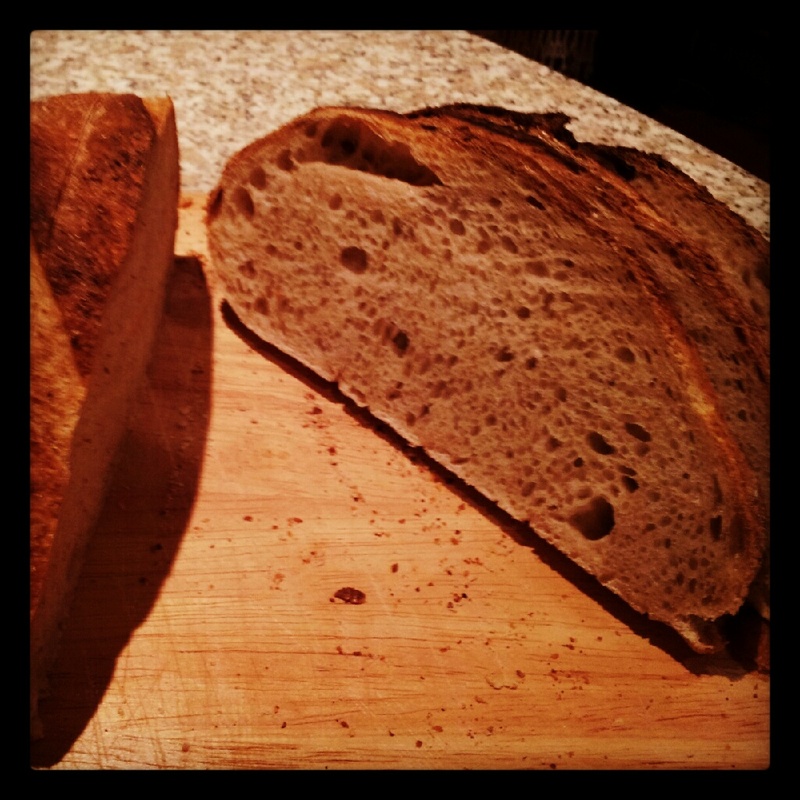 The term sourdough broadly applies to bread raised with wild yeasts. Defining characteristics of such breads are a slower fermentation and distinctly sour (but by no means unpleasant) flavour. Both are the result of high acidity caused by the presence of certain bacteria, among them lactic acid bacteria (the same bacteria used to make yoghurt), which colonise the starter among the yeasts. Making a starter is easy. 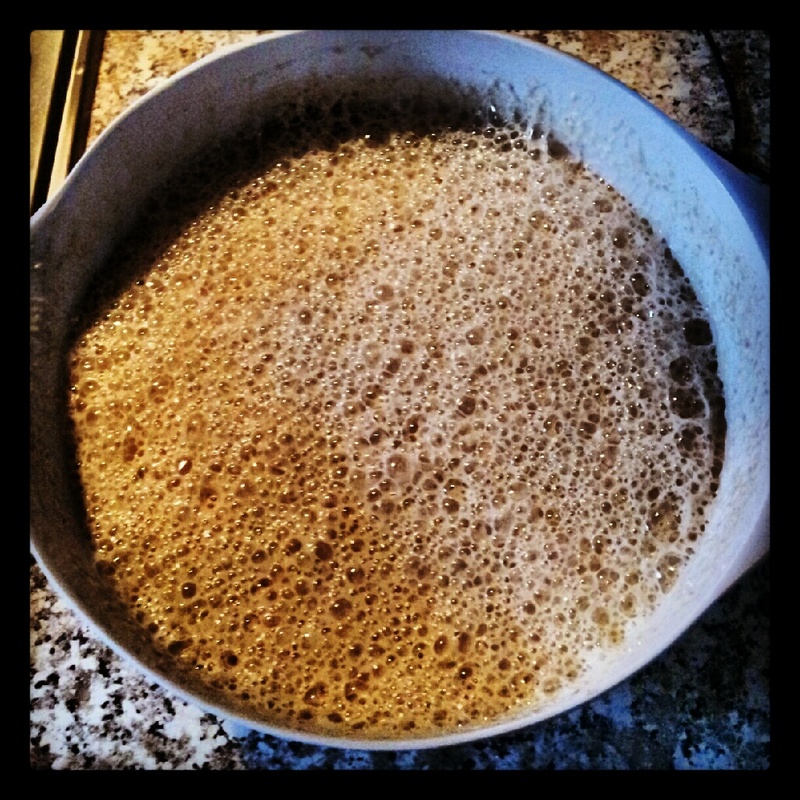 Yeasts need sugar, warmth and moisture to reproduce. All you need to do is provide these. Here is the recipe, if you can call it that. You need a big plastic container with a lid to make your starter in. It should be big enough to allow plenty of room for frothing – at least four times the volume of your initial batter (because you will add more later). You can use any type of flour you like; I have made excellent starters from rye, spelt and wheat. I recommend that you use wholemeal rather than white flour though; it will ferment sooner and more vigorously. There is no need to be precise about the quantities of flour and water. For the first stage, just use roughly equal volumes of each to make a thick batter and whisk it well – this incorporates more air and therefore, more yeast spores. Put the batter into the container, pop the lid on and leave it somewhere fairly warm. 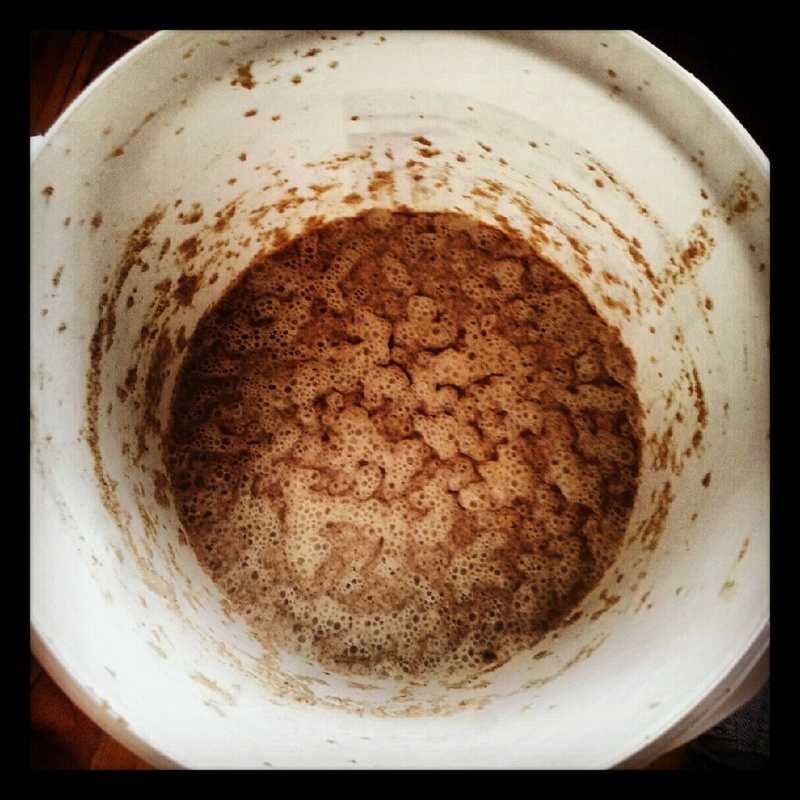 At some point, your starter will begin to ferment. This depends on many factors such as the flour used, how much you whisked it, which yeasts and bacteria happen to be around and how warm it is. Check every 12 hours or so and when you see the first signs of fermentation (small bubbles at the surface), give your starter its first ‘feeding’ by whisking in another 150g flour and 250ml warm water. Replace the lid and leave it again. Check your starter again after another day. Don’t worry if all this takes longer than you expect – it will get there in the end. When it does, I should warn you about the smell. You will either love it or hate it. It might be sickly sweet or sickly sour, smelling of vinegar, rotten apples, brandy or gone off milk perhaps. Breathe in deeply; I want you to remember this smell. Now tip out half of the starter and discard it. Replace this with another 150g flour and 250ml cold water this time. 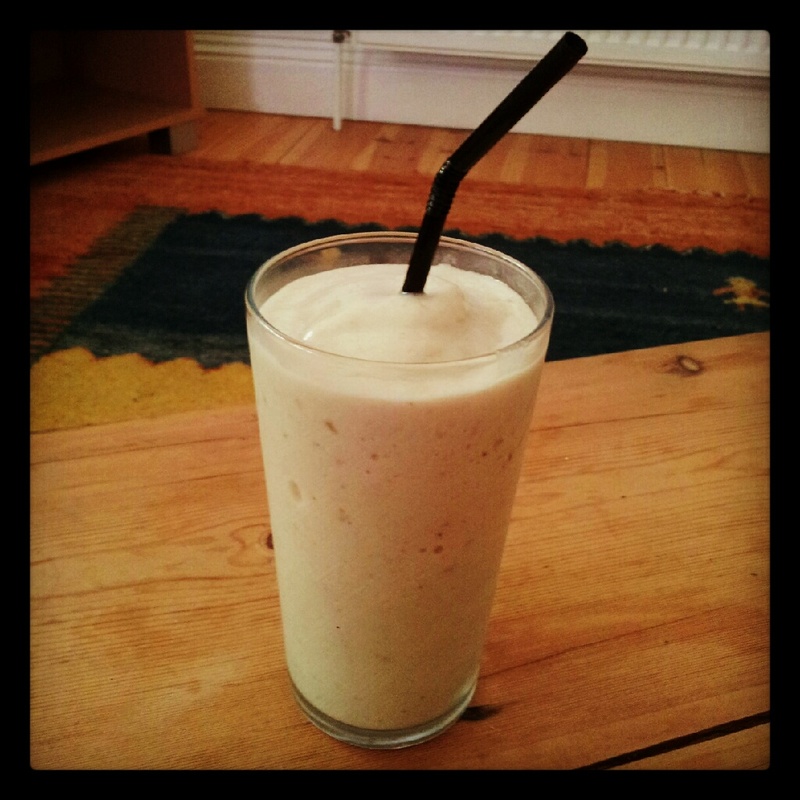 Whisk really well and leave it another day, at a fairly cool room temperature now. For the first week at least, while your starter is getting established, it is best to feed it daily, discarding half and replacing it. Keep smelling it and you’ll become aware of the aroma changing, becoming less harsh and more complex as it matures. 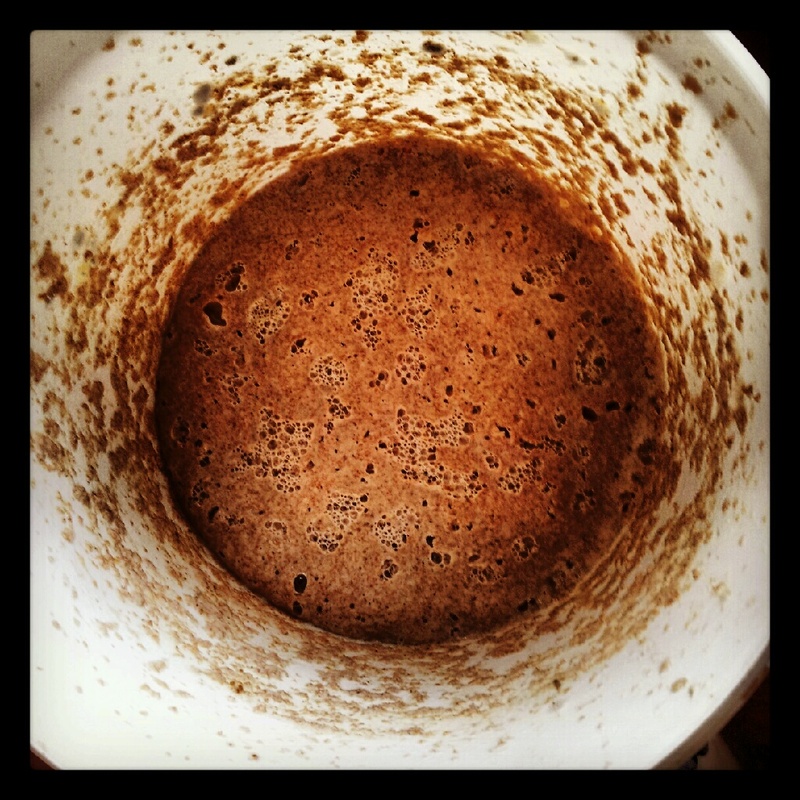 You will also notice different smells at different stages of fermentation. You will get to know when it needs feeding, when it is most active, when it is tired and sluggish and when it could do with a good beating. About a week into your routine of daily feeding, when fermentation is vigorous and regular and the smells have become established, you are ready to use your starter. Keep your dough in the fridge and it can go for a week without being fed. Add enough flour to make a stiff dough and you could happily feed it every three or four days. To feed a dough, discard half, make a new flour and water dough the same volume as the discarded part and knead it into the remaining starter. You could also do both of these then the dough will only need feeding every couple of weeks. What is important is that your starter is really active when it comes to baking, so at least a couple of days ahead, remove it from the fridge and bring it back to a thick batter by adding water and feeding daily until you bake. Nurtured in this way, your starter will live forever. You can even freeze the dough if you will not be using it very frequently. 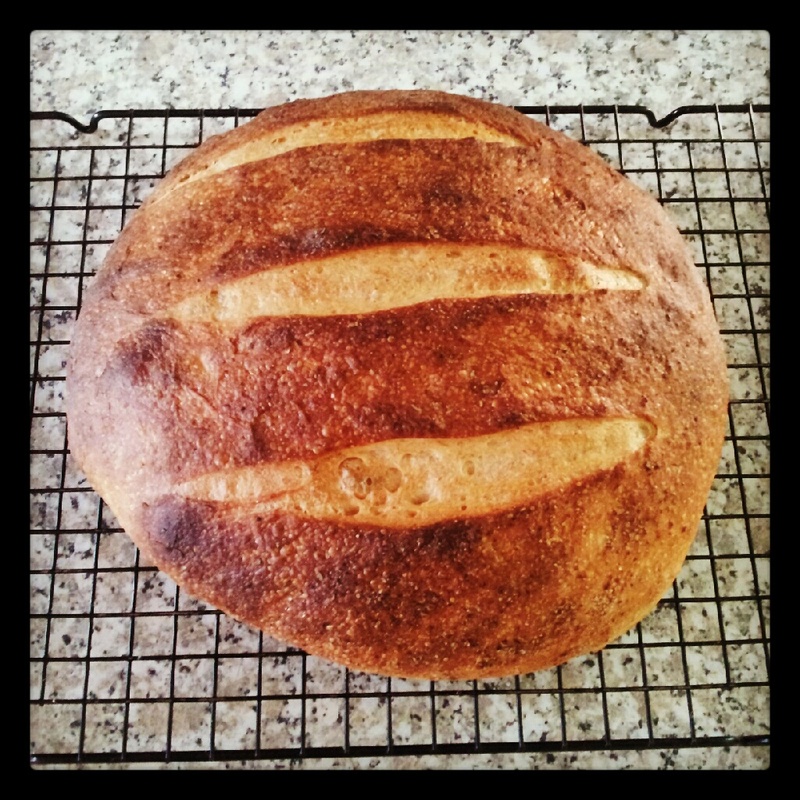 Sourdough baking is different from conventional bread baking only in that the process takes longer. I have provided a detailed recipe for a basic sourdough loaf in the next post (unfortunately, my IT skills lack to be able to insert a direct link for you). Deliciously chewy and tangy with enormous air holes and a fine savoury crust, this is one of my favourite breads. The large air holes are due to a wetter than usual dough so you may find it tricky to handle. The shaped loaves will be rather saggy and would benefit from the support of proving baskets if you have them. In any case, this sourdough will rise dramatically in the oven and will always end up looking glorious, if occasionally perhaps a little misshapen. This bread really is a labour of love. The starter takes about a week to make and establish if you don’t happen to have any to hand but while making it – as strange as it may sound – you develop a relationship and an understanding with your starter. You get to know it and what it needs and just a ladleful and a bit of nurturing can turn some flour and water into the most incredible thing. I recommend that you read the recipe through before starting to familiarise yourself with the timings and techniques. Although this is not a challenging recipe, you will need to set aside some time for this one. Perfect for a rainy day and the biggest sense of satisfaction achieved too! Before you go to bed, make the sponge. Mix the water, flour and starter together in a bowl. Cover and leave in a fairly warm place overnight. The next morning, mix the flour and salt into the sponge. Bring it together and squidge in a glug of olive oil. The dough should be soft and sticky – just kneadable but rather wetter than a normal dough. You will need some extra flour for your hands, the dough and worktop. It will be quite messy to begin with. Every now and then, clean your hands and scrape the worktop. Use more flour if you need to but be sparing with it – you don’t want to make the dough stiff or you won’t get big air holes. When your dough is smooth and satiny (after about 10-20 minutes of kneading), shape it into a nice tight round and place in a lightly oiled bowl. Cover and leave somewhere warm for about an hour. Now lightly oil the worktop and tip the dough out onto the surface. Press it out flat with your fingertips, shape into a round again, put it back in its bowl, cover and leave in a warm place for another hour. Do this twice more. You will see and feel the dough becoming smoother, shinier and more airy. After these four hours of rising and deflating, the dough will feel soft and puffy. Sink your hands in and diflate it once more. Divide into two or three and shape into loaves. Coat with rye flour and transfer to well floured wooden boards. Lay a plastic bag over the whole batch to stop it drying out and leave to prove for 2-3 hours or until doubled in size. You will probably notice big air holes developing near the surface. Unlike with other breads, you should err on the side of over-proving the loaves as the air holes will be bigger. When the loaves are almost ready, switch the oven to 250C, put a baking tray inside and place a roasting tin on the bottom shelf. Put the kettle on. Have a water spray bottle, a serrated knife and an oven cloth ready. Clear the area around the oven. You will need to work quickly now. When the loaves are ready, transfer them to the hot tray (removed from the oven). Slash the tops with the serrated knife. Spray the bread all over with water. Put the tray into the oven and pour some boiling water from the kettle into the roasting tin and close the door as quickly as you can. Turn the heat down after 10 minutes to 200C if the crust is still very pale, 180C if the crust is noticeably browning or 170C if the crust seems to be browning too quickly. Bake until the loaves are well browned and very crusty. They should feel hollow when you tap the base. In total allow 30-40 minutes for smaller loaves or 40-50 minutes for larger ones. Leave to cool on a wire rack. This bread is immense served just warm from the oven with a nice thick soup to dunk into. It is also amazing as sandwich bread, toasted, tossed into tomato salads or simply on its own. This really is the best bread I’ve ever eaten. It is so crisp and flavourful on the outside and the inside is so springy, tangy and chewy. Here is a really good recipe to prepare ahead. It can be served hot, warm or cold and packed as a picnic item or plated up with salad or vegetables, potatoes and gravy as a winter warmer. Play around with the flavourings you like in the sausage mix. Add different sausage meat such as Toulouse, Cumberland or Linconshire. Add fresh herbs, spices, berries, dried fruits, apple, nuts, chestnuts, mustard, bacon… anything! 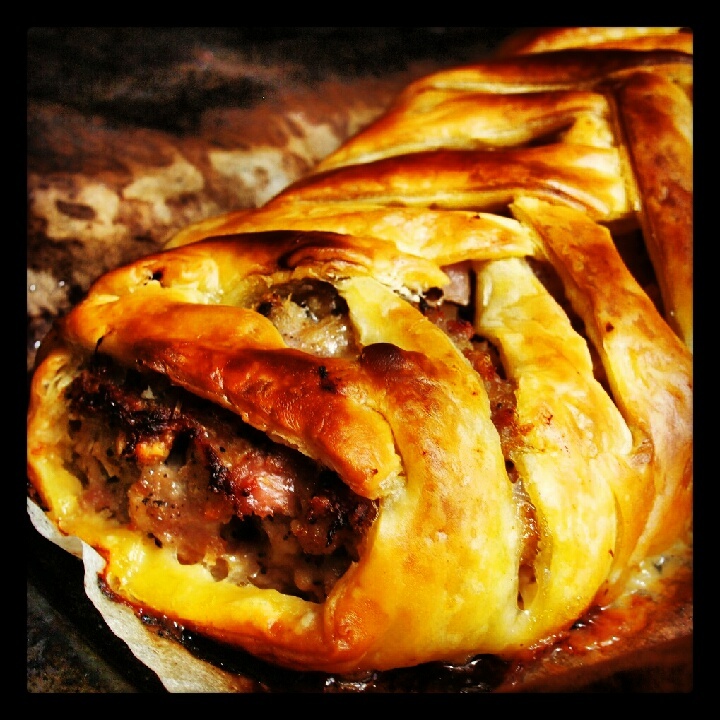 The addition of lean pork with the sausage makes the plait a little less greasy than a standard sausage roll and takes on the added flavours well. Preheat oven to 180C. Line a baking tray with greaseproof paper. Beat 1 of the eggs and water in a small bowl. Set aside. Mix remaining egg, sausage, pork mince, bread crumbs, onion, rosemary, fennel and cinnamon with seasoning in a large bowl until well blended. Carefully roll the puff pastry out and place on lightly floured work surface. Cut lengthwise into 2 rectangles. Create strips by making 1½-inch long cuts 1 inch apart down both long sides of each pastry rectangle. 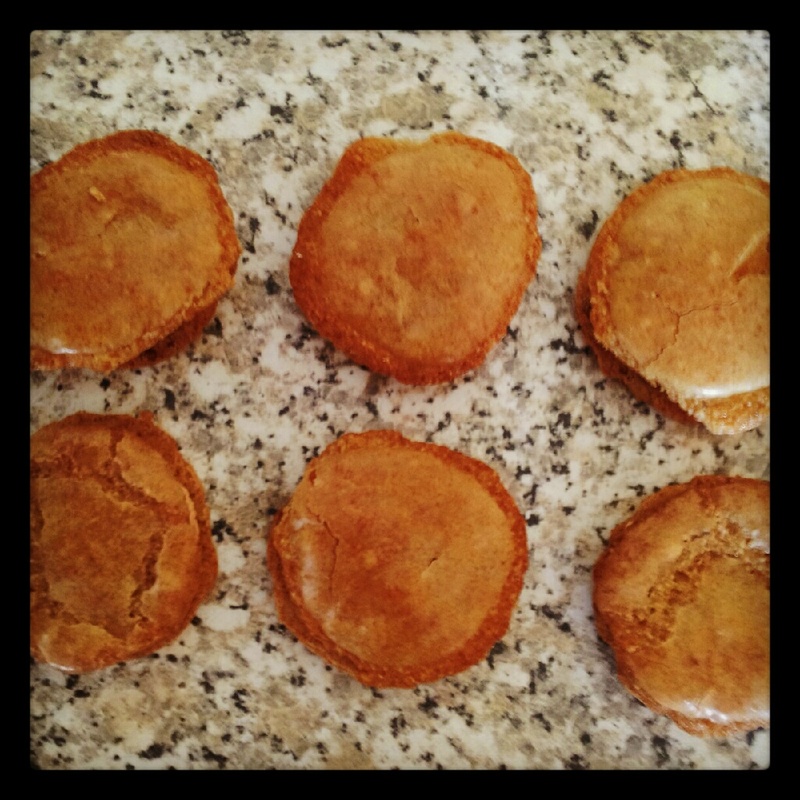 Spoon ½ of the sausage mixture down the centre of each pastry rectangle. Dampen the edges of the pastry strips then fold 1 pastry strip at a time over the sausage mixture, alternating sides, overlapping the prior strip to enclose the sausage mixture. Place on the prepared baking tray. Lightly brush the braided pastry with the beaten egg and water mixture. 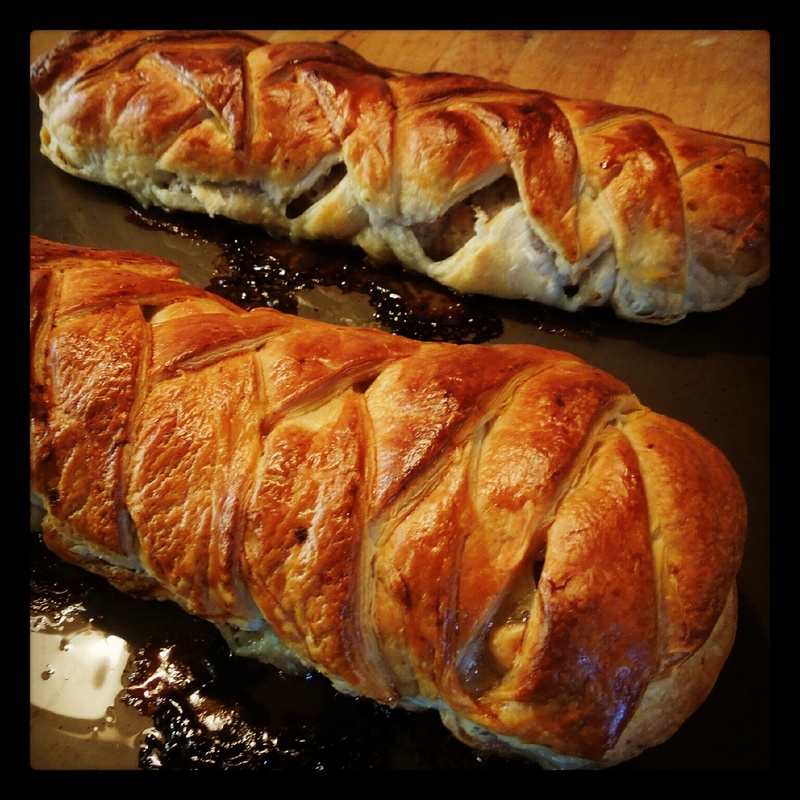 Bake for 35 minutes or until the pastry is golden brown and the sausage meat is cooked through. Cool on the baking sheet for 5 minutes. Cut each pastry into 3 pieces to serve. the sausage meat is cooked through. Cool on the baking sheet for 5 minutes. Cut each pastry into 3 pieces to serve. 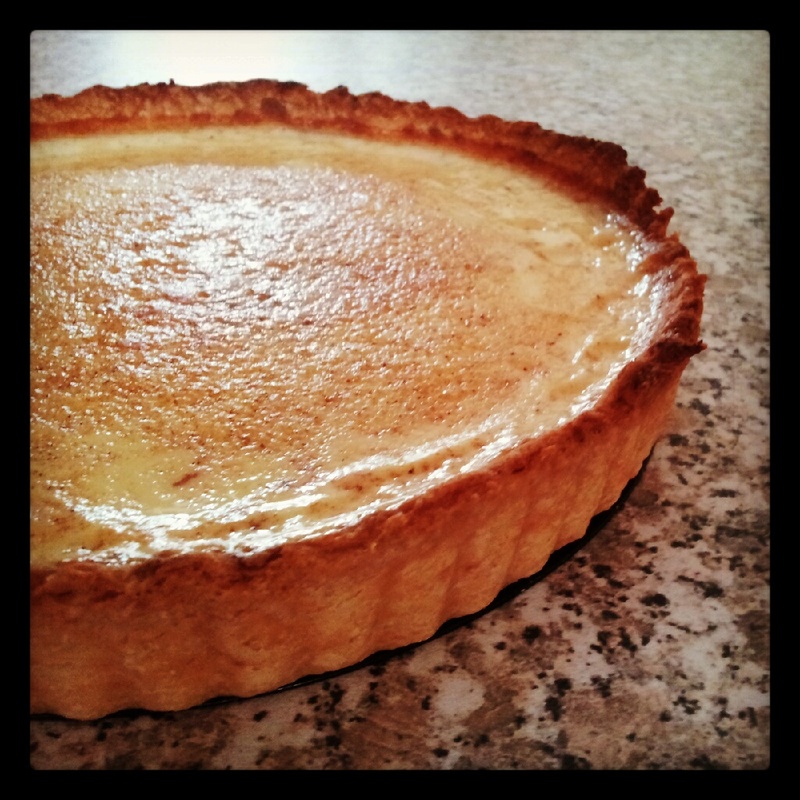 A good egg custard tart is so simple but so many times, done wrong. 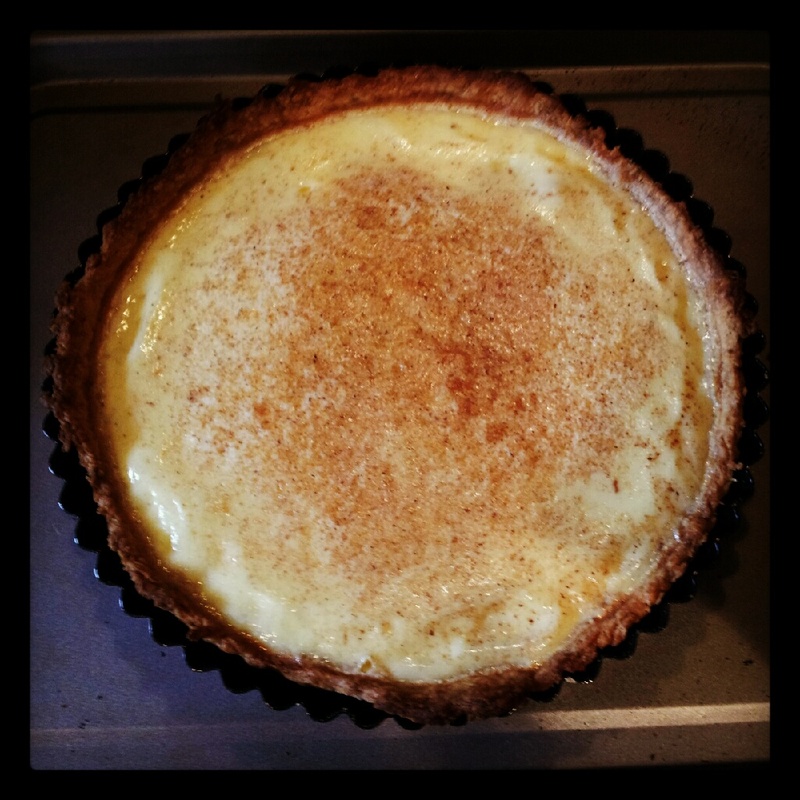 The tart should have a buttery, rich and crisp pastry with a smooth, velvetty custard filling that has just set and is lightly spiced with nutmeg. Follow my tips below for a wonderful treat! To make the pastry, sift the flour, salt and sugar into a mixing bowl. Add the diced butter and run in with your fingertips until the mixture looks like fine crumbs. Using a round bladed knife, mix in the egg yolk and water to make a firm dough. If the mixture seems a bit dry and crumbly, stir in a little more water a teaspoon at a time. Wrap the dough in clingfilm and chill for 20-30 minutes. 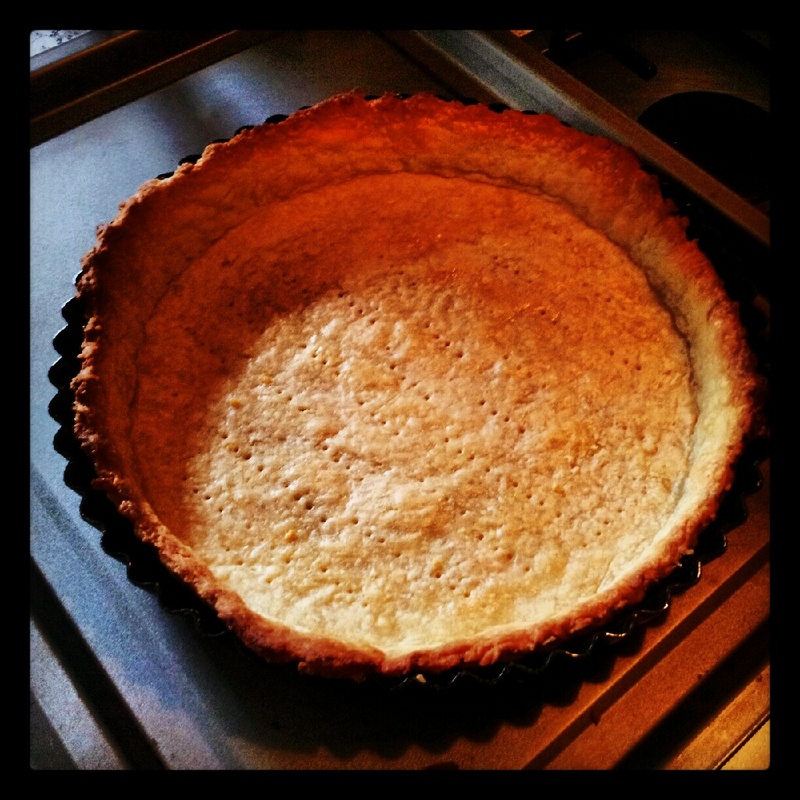 Roll out on a lightly floured work surface to a circle about 28cm across then use it to line a 23cm loose-based deep flan tin. Prick the base with a fork then chill for 15 minutes. Do not make the holes go all the way through the pastry. Meanwhile, heat the oven to 190C. Line the pastry case with greaseproof paper, weigh down with baking beans, rice, flour etc and bake ‘blind’ for 15 minutes until lightly golden and just firm. Remove the paper and beans and bake for a further 5 to 7 minutes until the base is thoroughly cooked, firm and lightly browned. Remove from the oven and leave to cool while making the filling. Reduce the oven temperature to 150C and put a baking tray in the oven to heat up. 3. Put the cream and milk into a saucepan, add a small grating of nutmeg and slowly bring to the boil. Remove from the heat and leave to cool for 5 minutes. 4. In a heatproof bowl, thoroughly beat the eggs and yolks with the sugar with a whisk until lighter in colour and very smooth. Stand the bowl on a damp cloth so it does not wobble then gradually pour the hot cream into the bowl in a steady stream, stirring constantly. 5. Set the flan tin on the hot baking tray and strain the mixture through a sieve into the pastry case. Grate nutmeg over the surface – you can be quite generous – then carefully transfer the tray to the oven and bake the tart for about 30 minutes until lightly coloured and just firm – it will continue to cook for a while after it is removed from the oven (if overcooked, the mixture will curdle). Leave to cool then carefully unmould. Serve at room temperature the same day for best results. Can be stored in the fridge for a couple of days loosely wrapped in foil. 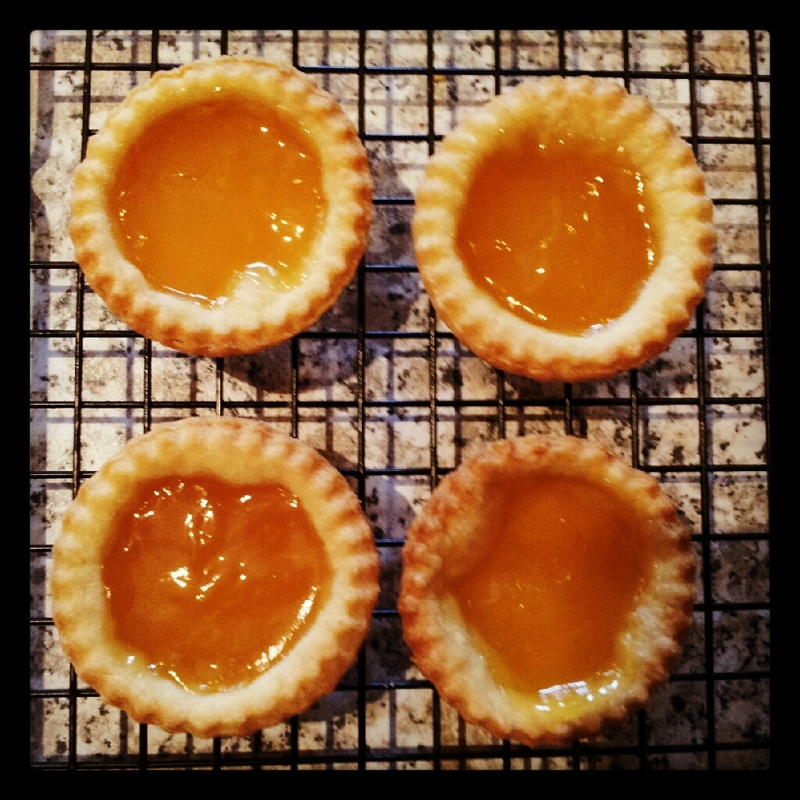 I had lemon curd that needed using so these are lemon tarts but you can use your favourite jams too. Seedy raspberry jam, blackcurrant and strawberry are all tried and tested favourites but use whatever you like. 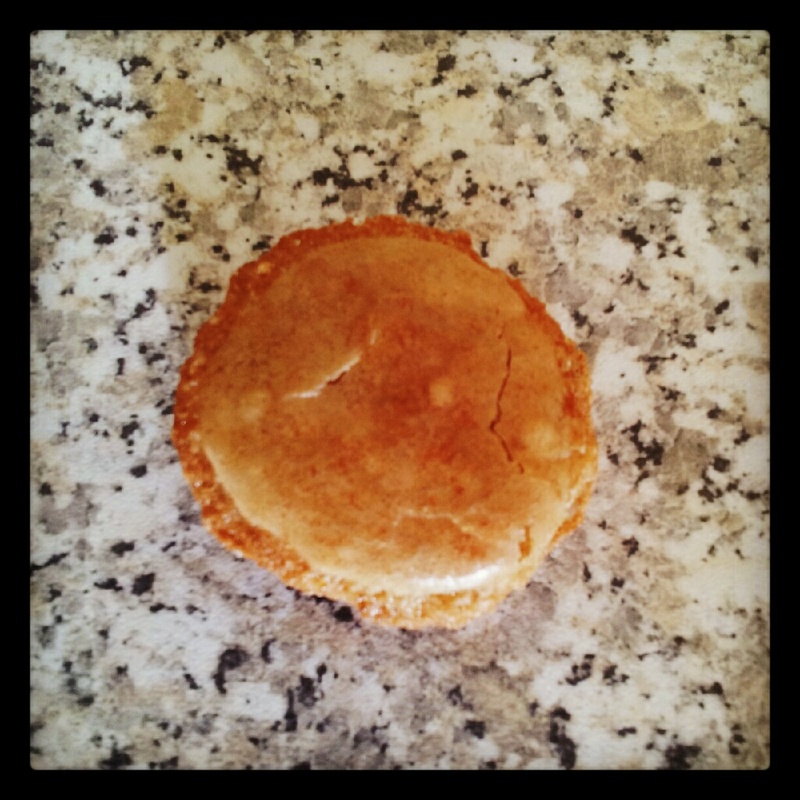 The pastry is flaky and crisp and the filling is sweet and sticky. 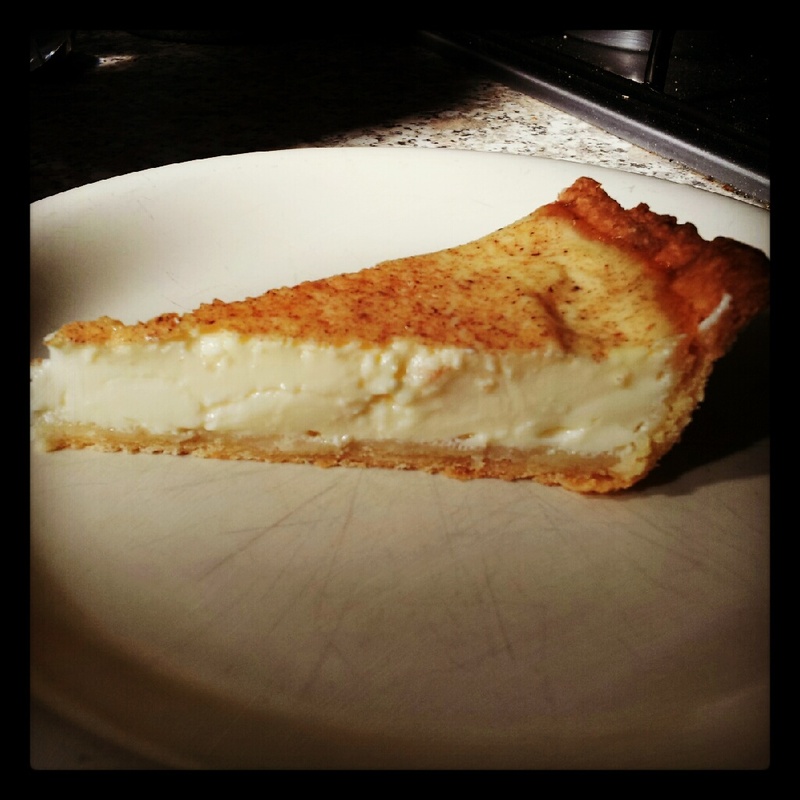 It’s a perfect little sweet treat plus the recipe for shortcrust pastry is so simple and delivers great results. Give it a go! Sift the flour and salt into a large mixing bowl, holding the sieve up as high as possible to give the flour an airing. Cut the fat into small cubes and add them to the flour. Now, using your fingertips, gently rub the pieces of fat into the flour – lifting your hands up high as you do this (again to incorporate air) – and being as quick as possible. When the mixture looks uniformly crumbly, start to sprinkle roughly 2 tablespoons of water and a squeeze of lemon all over. Use a round-bladed knife to start the mixing, cutting and bringing the mixture together. Carefully add more water as needed, a little at a time. Finally, bring the mixture together with your hands to form a smooth ball of dough that leaves the bowl clean. Wrap the dough in clingfilm and refrigerate for 20-30 minutes. Once chilled, roll the pastry out on a well floured surface to an even thickness of about 3-4mm. Use a 3 inch cutter to cut out as many rounds as you can and lay them into cupcake tins then lightly press them down to shape. Fill each pastry case with a teaspoon of your chosen filling and bake in an oven pre-heated at 200C for 10-12 minutes until the pastry has lightly browned around the edges and the filling is bubbling and hot. Remove from the oven and leave to cool for a few minutes in the tins before transferring to a wire rack to cool completely. 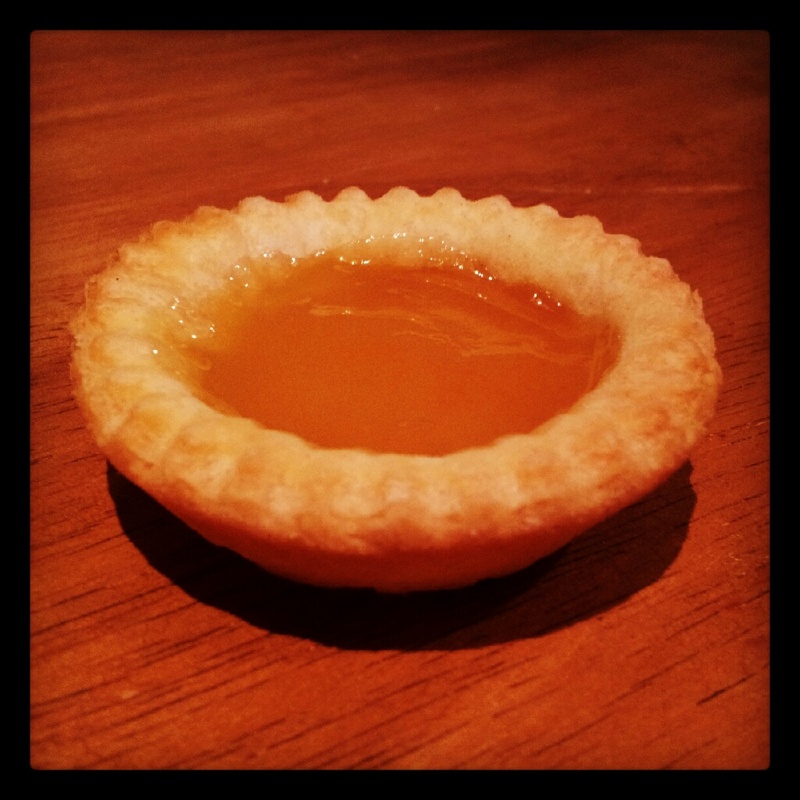 Store the cooled tarts in an airtight container for a few days. 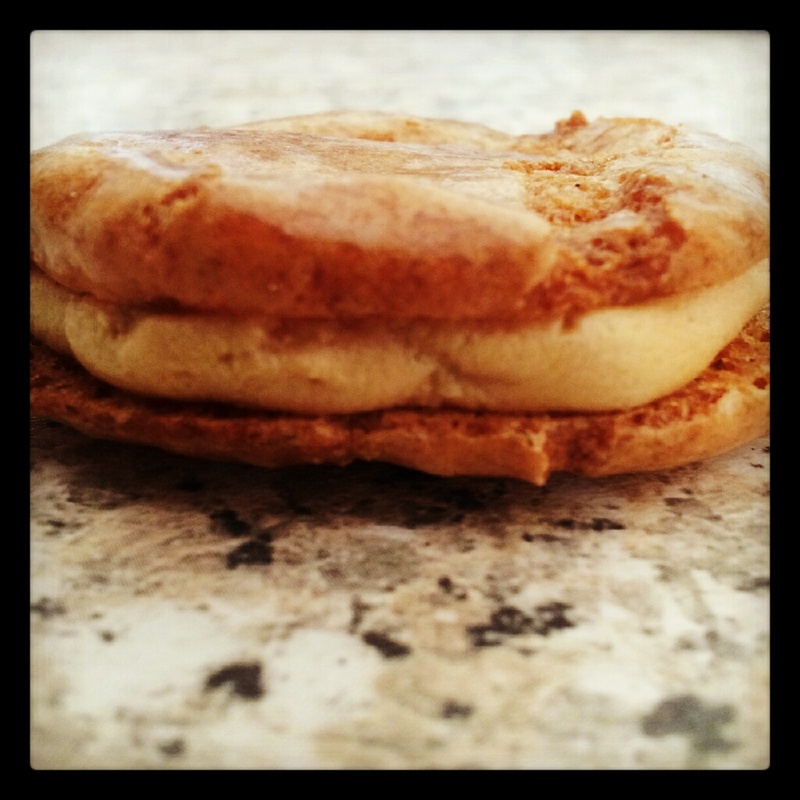 I’ve never made or even eaten a macaroon before. I always thought they seemed a bit ‘art for art’s sake’ but I can see what all the fuss is about now. They are a variety of textures and flavours. 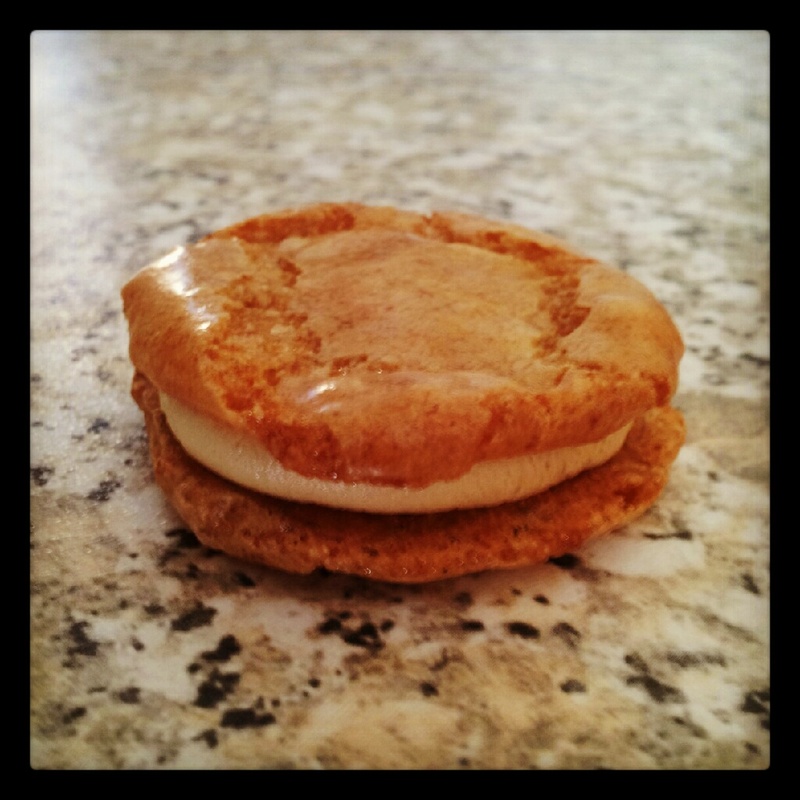 Chewy, crunchy, melting and creamy. Sweet, nutty and spiced. Mine are freeform so are not quite as refined as the ones you find all specially packaged in the shops but the taste is mega! 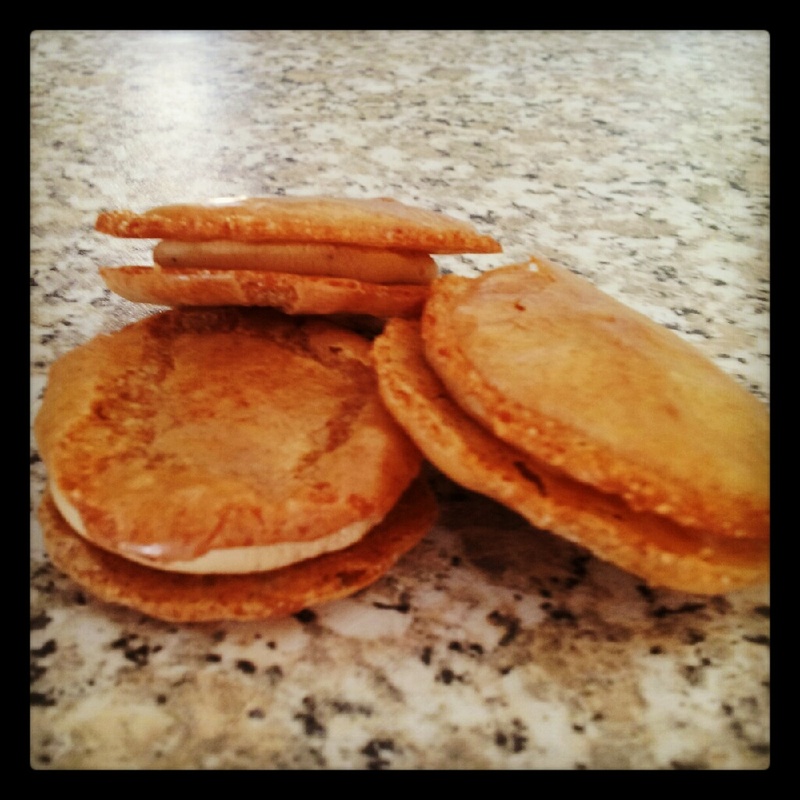 Any excuse to use a bit of biscoff! Let your macaroons have time to ‘mature’ before eating. This means, after you bake and fill them, don’t eat them for at least 24 hours. Let them sit in the fridge for at least a day. They are good when they come out of the oven but they are 10000x better after you let them sit for a day or two, trust me. I used ground almonds for this recipe but ground them really fine with my trusty pestle and mortar then scraped them through the sieve with the back of a metal spoon. Preheat oven to 150C and line a large baking sheet with parchment paper. Weigh your egg whites, almond flour, powdered sugar, granulated sugar and ground Biscoff cookies. Add the weighed out egg whites, and sugar to a large mixing bowl and whisk until stiff peaks form. Set aside for a couple minutes. Place the powdered sugar, almond flour, cinnamon and cookies into a large mixing bowl. Stir to combine. Place in a sifter or fine sieve and sift until all dry ingredients have passed through. Gently fold in the egg whites to the dry ingredients, mixing only until just combined. Place batter into a large pastry bag with a large round tip attached. Pipe rounds, about ½ inch apart onto a parchment lined baking sheet. Draw small circles onto the parchment paper to help guide you when piping. Give a good tap or two of the pan to remove any bubbles. Bake the macaroons for about 10 minutes. You’ll see a shell on top with “feet” around the edges. Let cool completely before removing. Once cooled, take an offset spatula to loosen from parchment. You may need to bake the macaroons in batches to use up all the mixture. 6. Pair the macaroons close in size to each other to prepare for filling. 7. To prepare buttercream, beat margarine, creamy Biscoff spread and powdered sugar with a pinch of salt and the cinnamon until creamy and smooth. Add a splash of milk to loosen the mixture slightly if needed. Place buttercream into a medium pastry bag with a large round tip attached and pipe a dollop of frosting on the centre of a macaroon and top with a second macaroon. Gently press the macaroons together so the buttercream nearly reaches the edges taking care not to crush the shells as they are very delicate. Serve room temperature. Store any remaining macaroons in the fridge.